Tami Noble is the Program Manager and Fiscal Director for Idaho EPSCoR. 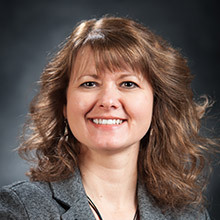 She provides fiscal management and oversight of NSF EPSCoR at the University of Idaho and partner institutions in Idaho. Prior to joining EPSCoR, she worked with the National Institute for Advanced Transportation Technology (NIATT) as the Assistant to the Director for six years and the Civil Engineering Department as the Department Manager for four years. Tami earned her Bachelor's degree in business administration from Idaho State University.